Hey, Christmas crafters! Did you know wreaths have been a household decoration since Christmas was first celebrated? In fact, they were around long before Christmas originated as a holiday. First used specifically with the Advent season in mind, Christmas wreaths have become a staple in almost all households at Christmas. Now, wreaths are made from almost any material you can think of! They are one of the most popular Christmas decorations out there. After all, do you know anyone who doesn’t have a single wreath hanging in their home at Christmas? I didn’t think so. The many innovations on the wreath design now involve different materials, shapes, and sizes, all of which are so unique and so gorgeous! Because of the popularity of wreath decorations, AllFreeChristmasCrafts is pleased to announce the release of a brand new free eBook! In this free eBook titled How to Make Wreaths: 15 DIY Wreaths for Christmas, you are sure to find a fabulous wreath craft to decorate your door this holiday. Store-bought wreaths can get insanely pricey incredibly quickly. Save on your Christmas decorating this year with wreaths made from recycled materials! 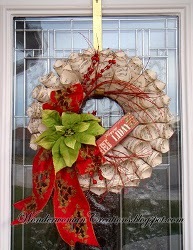 Take apart a book of old sheet music or upcycle a box of sandwich baggies to make a gorgeous wreath for your door. Guests will ask you where you bought your fancy wreath, and you can delight in telling them the creative techniques you used to make it! Fabric wreaths are often a soft and cozy way to accent your Christmas decorating. Many of these wreath crafts involve upcycling an old sweater or stash-busting an array of fabric scraps. 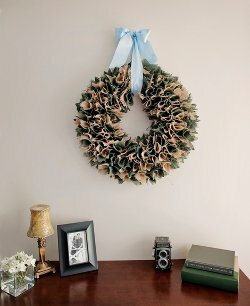 If you’re a fan of the burlap trend, we’ve got burlap wreaths aplenty! Accent your door with any of these beautiful projects. Taking a step outside the “traditional evergreen wreath” box, we have a great collection of unique wreath ideas. 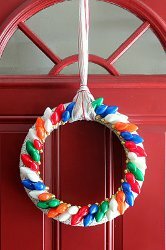 You can learn how to make a wreath with Christmas light bulbs, Styrofoam balls, beads, and more. Expand your wreath crafting interests to any of these fabulous ideas. Learn more and download How to Make Wreaths: 15 DIY Wreaths for Christmas today! Do you prefer traditional evergreen wreaths, or do you prefer the innovative designs?